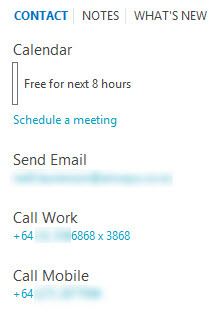 Noticed a nice little addition to my Lync Contact’s contact card. Its a little audio icon next to the contacts name. Hover over it and see the tip text “Click to listen to this contacts name”. This only appears for users who have recorded their names in UM. Clicking on the icon simply plays the name as recorded by the user. Great for getting the pronunciation correct, no idea when this was introduced.